It takes a week for the adrenaline to wear off. It takes longer than that for sting of jet lag to mellow. It takes time for one's ear warm to other languages. One's brain must sharpen to the constant calculation of currency exchange rates. But, once the body, mind, and soul convert to Italian it all changes. Life settles into the sweet cadence of life in Venice. The hardest part is not lamenting the passage of each day. Soon the trip is half over, an impossible realization. It is New Year's Eve and the pulse of Venice quickens to the beat of 100,000 invaders. Piazza San Marco is a place to avoid for those of us who prefer a mellow greeting to the new year. But even the peripheries are bustling with activity. Thinking ourselves to be sly, we go off the beaten path and escape it all, warming ourselves in a cozy bar with a Spritz. With a clear view of the Giudecca Canal we watch the world from the bar window. The sun sinks over the low buildings on the other side of the canal. Foot traffic builds as day turns to the dusk of a golden New Year's Eve. I look to the west and things look strange. The normally clear view of the industrial port of Marghera is gone, now shrouded in an opaque blanket of white fog. I strain my eyes and look harder. Now the western edge of Giudecca is gone. Within five minutes everything is lost in dense and milky white. 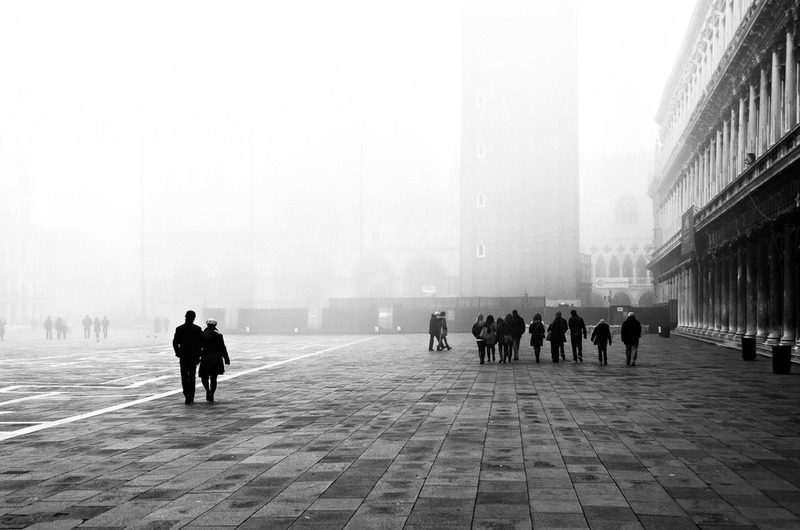 Fog in Venice. Its romance and mystery is broken momentarily as we leave the bar. The biting cold hits us in the face and digs deep into our bones. But it instantly dampens the chaos of New Year's Eve and turns the city into a translucent ghost town. A hush falls on both canals and pavement. The vibrant echos of hard stone are now dampened by the softness of the cold, wet air. Shaking off the chill, we walk into the fog and into the second half of our journey. We walk off into the nebulousness of a new year. And on the way we reach that blissful state of being neither here nor there. Like floating in a pool of endless time we are at one with the fog and with Venice. I look out, not wanting this moment to ever end and imagine that this is as close to perfection that this life has to offer me.